When you buy a car, you can see it in the showroom before you buy it. When it arrives, it is exactly as you had envisioned and there are no (nasty) surprises. With Dioxide Pacific, it’s the same with everything we build. 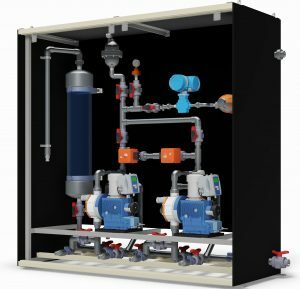 It may be a standard product like our Electricide® chlorine/chlorine dioxide generators or a bespoke chemical dosing skid. Either way, we always produce a 3D model of the system using Autodesk Inventor, which becomes the template for our staff to build the item. Generally, we don’t produce 2D fabrication drawings as we find the 3D model is easier and more accurate to build from. When you order a system, you’ll be provided with the 3D model and the ability to view the model from different angles; parts transparent or hidden and measurement tools. You can ask for changes to be made at that time until you are happy with the layout. The built system will be exactly the same as the 3D model you have approved. It will fit in the space you have allocated and connect to services exactly as promised. 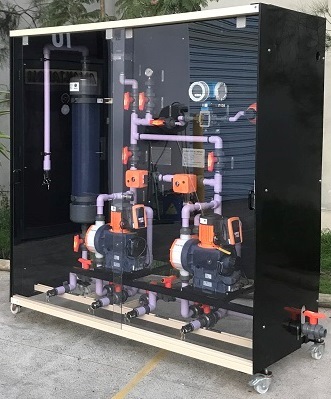 Dioxide Pacific recently designed and built a chemical dosing skid for sodium hypochlorite for an odour scrubber. The dosing skid is a powder coated stainless steel frame with Fiberstrut base, HDPE sides and a polycarbonate splash screen. Metering pumps ProMinent Sigma/3. All accessories including actuated ball valves, mag flow meter, pressure gauge and pulsaton dampener are fixed to the HDPE back using Fiberstrut bolts and pipe clamps. The 3D model was developed from the P&ID and approved by the customer prior to fabrication. When complete, the skid was tested at our works and delivered to site. Time frame from approval of the 3D model to delivery was 4 weeks. This short time frame was critical to the customer. Interested to know more or obtain a quotation? Dioxide Pacific can provide design drawings and manufacture storage, transfer and dosing systems for just about any chemical you can name. We’ve been doing this successfully for more than 17 years. Looking for a quality outcome – we won’t let you down.